Holiday season is approaching, which means there is an endless amount of new makeup from every brand on the market. Since I started collecting makeup, holiday season became a lot more exciting because brands come out with amazing collections and beautifully packaged exclusive products. This year I didn't pick up a lot, I carefully considered which ones I would truly cherish and not just buy everything. I cannot assure you that I will not add more products *oops* to this pile, so I guess this is part one! The NARS Velvet Lip Glide in Bound is not limited edition, but it launched not long ago. It's a lipgloss - liquid lip hybrid, I think of it as a highly pigmented lip gloss with the texture of a creamy lipstick. I have worn this a couple of times and I absolutely love it. It feels soft and cushy on the lips, very comfortable, it also applies evenly. I cannot really compare this to any lip products that I have tried, you have to try it to know what I mean. The second NARS number I picked up was the NARS Sarah Moon True Story Cheek & Lip Palette. I'm in love with the aesthetic and design of this collection, it has an ethereal and angelic feel to it, the opposite of last year's collaboration with Steven Klein. I want to continue collecting NARS limited edition palettes and that's why I got it. 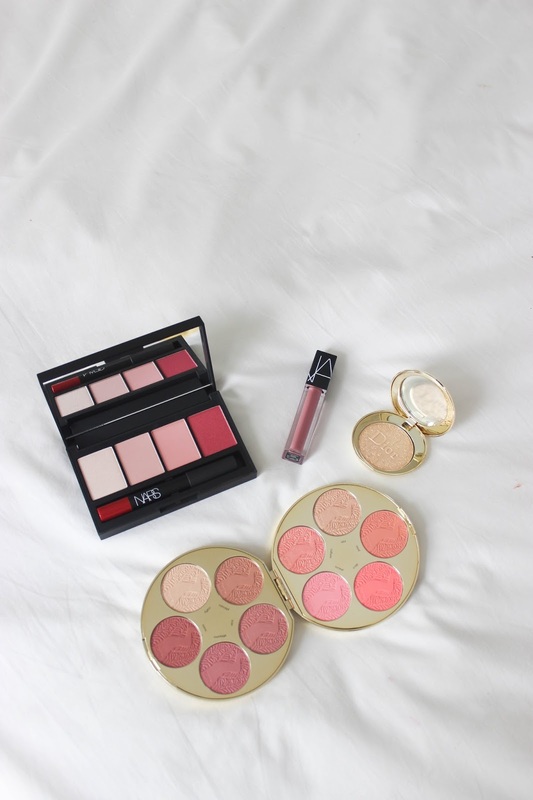 How beautiful are the blush shades though? They remind me of winter. Also, I already know I love the quality of NARS blushes and Velvet Matte Lip pencils, so it's a complete win for me. Dior came out with one of the most beautiful and sought after holiday collections this year. The Dior Splendor collection with its sequin inspired design has captured many collector's hearts. My choice from this collection is the Diorific Splendor Illuminating Face powder which is so. beautiful. and not to say precious. This is my first Diorific face powder so I was entirely taken by its packaging the first time I held it in my hand. I assume this is the kind of compact screen sirens from the 40s would have used. The product itself is beautiful as well. I bought this thinking I was going to use it, but no, I won't. Last but not least we have the well anticipated Tarte Color Wheel Amazonian Clay Blush. We get 10 blushes inside a circular compact, for the price, this is a total steal! This palette has such great value it would be stupid for me not to get it. If you have been a loyal reader or follower you would know I love Tarte Amazonian Clay blushes, and I have been thinking that my collection has gotten a bit dull. This palette has definitely perks things up for me! I am so excited to use this palette. What did you score on this holiday season? Let me know!